The fish has been soaking the night prior. Whenever a Newfoundlander says “fish” he is referring to cod fish. If he is talking about other types of fish, he will call it by name. 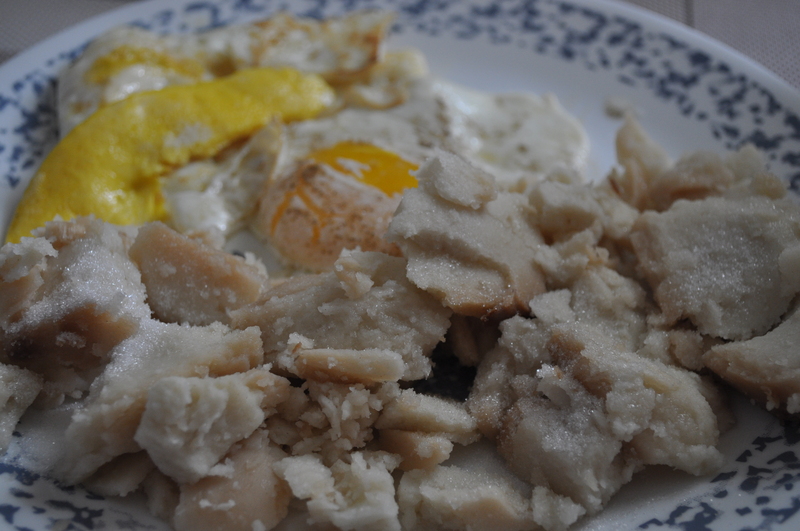 Today for dinner, I was able to enjoy a great meal of Fisherman’s Brewis. The recipe is simple, yet big on delivery. You need hard tack (Famous Purity Hard Bread). This should be soaked in cold water until soft. We used three cakes for our meal. 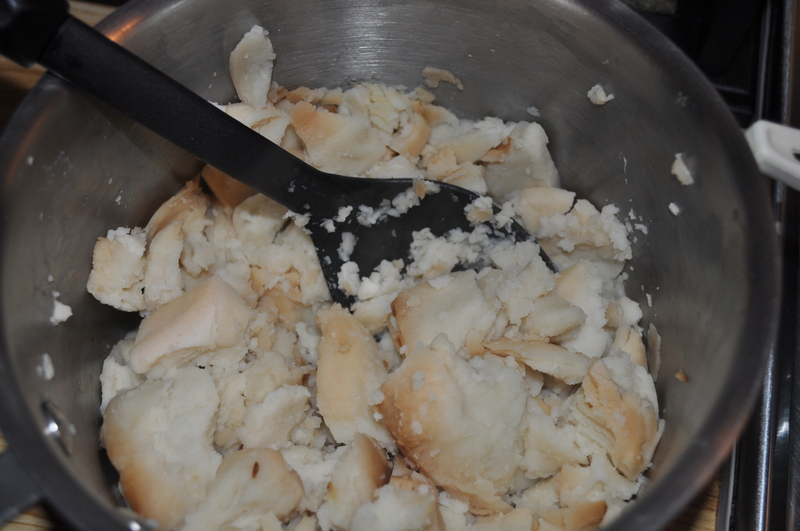 We had some already filleted cod, so we did not need to be as worried about the bones. One must fry fat port until a little brown. Cook fish, add the hard bread and mash it all together and served. This meal can be cooked within a short 20 minutes. We had a side of boiled potatoes, homemade pickles and buttered or Crosbie Molasses “Lassie” bread. This is a treat to the standard brewis on Sunday, when hot dinner is not being served. The conversation was around how we should have this heritage meal more often. After the meal, I steeped a cup of Screech tea made locally by The Dark Tickle Company, St. Lunaire-Griquet on the Great Northern Peninsula. There is truly something great about Living Rural and enjoying traditional recipes that have been mainstays of Rural Life for centuries. Our beloved Purity Factories resounds to all Newfoundlander’s & Labradorians as being quintessentially “home grown”. The Purity brand since 1924 has been served in households and played a big part of growing up in Newfoundland & Labrador. Ask any Newfoundlander & Labradorian about their ever so popular Cream Crackers, Syrups and Candies (Peppermint Nobs, Climax Mixture or Assorted Varieties of Kiss Candies). According to Purity’s website, they make more than 50 products. Even today, following a dinner out of office, our employer had a package of the famous Peppermint Nobs in his car. It was the perfect after meal treat. Who really needs tick tacks anyway? The company touts itself as a leader in family tradition across the island for nearly a century. In a recent article about the Mummer’s Walk & Food Drive, I noted the syrups were served as they would be locally when the costumed “Mummers” would come ’round at Christmas. In the Lure of the Labrador Wild, on the Exhibition – Wallace and Hubbard had taken many pounds of hard tack or hard bread – a staple of many Newfoundlander’s & Labradorian’s diet; especially for fish n’ brewis. This holiday season, there were worries as no Purity Hard Bread could be found at local retailers and other related products. This occurred in part by the company locking out its workers, affecting production. I searched online selling and auction sites, eBay and Kijiji to find a couple of sellers with the product willing to part with a bag at a premium price tag. Tuesday night brought good news! After four months of a lock-out, the union and management reached an agreement, which means our favourite products will be available locally in abundance and other specialty retailers outside of province. First of all, I love Jam Jams! Secondly, I will never forget visits to my grandmother’s house when I was younger. I would always ask for a glass of the Strawberry Purity Syrup. She would know exactly how to mix it, so that it had an extra special feel for the tastebuds. As well, can not forget disliking the brewis and eggs we had some Sunday dinner‘s when church service was in the morning. Now, I certainly enjoy a heaping serving of the Purity Hard Tack! When I travel to Europe and other destinations, or want to give someone a treat from my home province, I ensure to bring Purity Kiss Candy. They have become popular with my friends. This past fall, two German girls couchsurfed at my house and they really loved the variety of flavour, as well as the classic packaging. These are memories made in part by an iconic company that truly is local, unlike companies such as Tim Horton‘s, Molson and the Hudson Bay Company which started Canadian are now owned by foreign stakeholders. Buying local supports local jobs, builds a stronger economy and allows our communities to prosper. Next time you consider making a purchase, the savings from a big box store to a small local business may be nominal when you consider all the costs, foregoing customer service and the potential loss of the service in your own community when there is an essential need and the distance to the big box store is beyond reach. Many small towns in Europe survive and thrive on small business, complimenting each others services so they are not competing for same small pool of consumers in the local market. To close, memories can be made with Purity products, or with other local products. We have a rich culture and tradition, why not build your own brand? Opportunities are around every corner here in Rural Newfoundland & Labrador.